Tease you? Don’t mind if I do! Moral of the above rant? You’ve missed out on loads and I have loads to tell ya! Keeping this blog’s tagline at the forefront of all that I write: One single mom’s meditations on motherhood, meeting “The One”, and mesmerizing her daughter…one adventure at a time, I have so much to share! Kam and I have indeed gone on many adventures and she has been quite mesmerized! In addition, touching on “The One” part of that tagline, although I do not recall if I have ever shared matters of the heart before…I am madly in love with the man I know God created me for (as is he) and I yearn to share my testimony.! I have so many other meditations I’d like to share, so please stay tuned. Moral of the above second rant/tease? Stay tuned and keep reading. 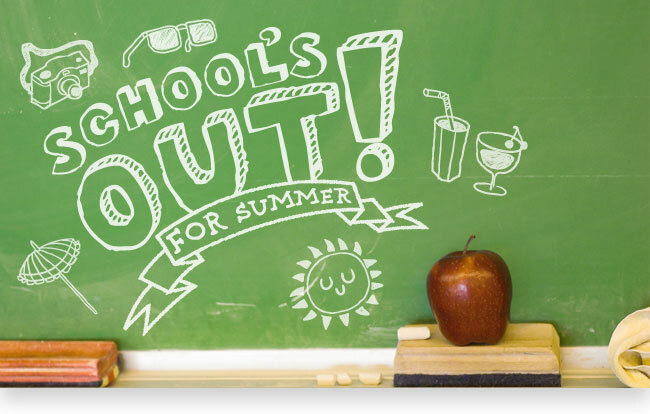 As summer winds down for most, my summer is about to become extremely busy, but I am determined to finish what I started with this blog… Sharing my life and leaving a legacy. So it’s all done now. I went to court a few weeks ago and it’s been settled. I met with the attorney, signed the order in front of the judge, and left the office, relieved to put all of this behind me, behind us. Some may say I got off light: a year probation. If these past few months have been any indication, my punishment will most certainly last longer than a year. I think it is something that will stay with me for a lifetime. I originally started writing this post on August 3rd. It is now August 31st and I have finally found it in me to complete it. For the most part, I am finally able to speak about it without tearing up. This is a story I feel needs to be told, but there I go again, starting at the end. Let me take a few steps back and explain how I got here. 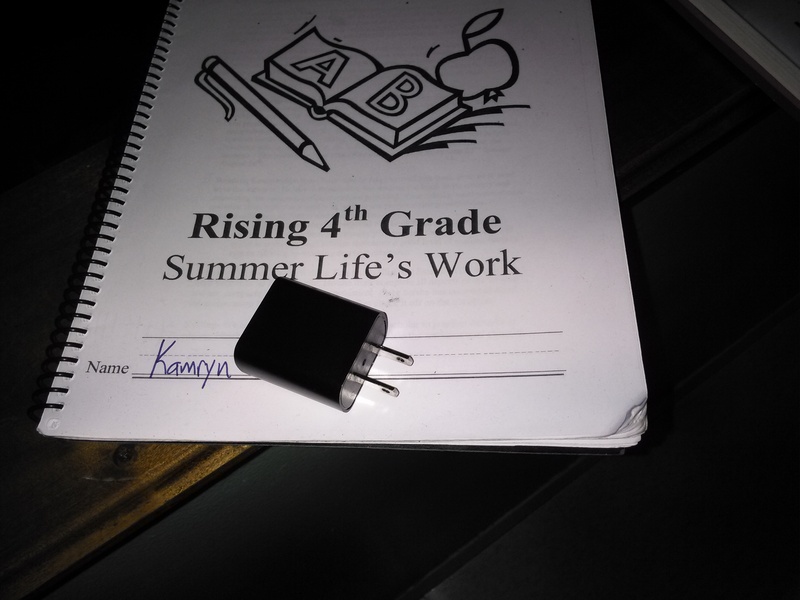 Kamryn sat with tears streaming down her face while sitting in front of my desktop and on my phone on a few occasions. She had become obsessed with searching for pictures of tanned Pomeranians, wrinkly-faced Pugs, teeny Yorkshire Terriers, and snow-white Maltese pups. She had come up with names for potential dogs (Susie, if it was a girl, Tiny Elvis, if it was a boy) and had pleaded with me to have one. As opposed to buying the Barbies she had originally intended to with her allowance she had been saving up, she used some of it to buy a few puppy magazines. She ripped posters of puppies from the magazines and plastered them all over her room. From the closets to the walls, to her front door. Before we moved (it will be a year next month) we would sit in our old apartment (which by the way only had one closet…one closet, two girls…gasp! 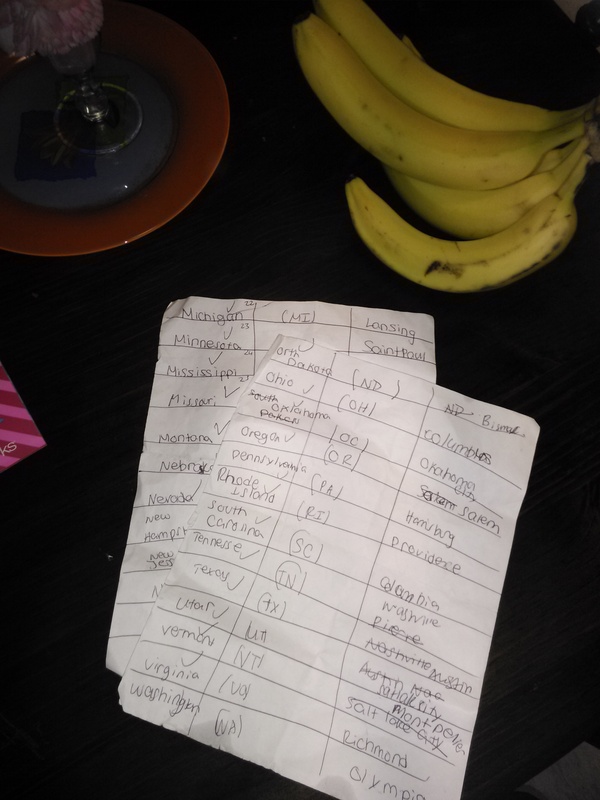 A recipe for disaster!) day-dreaming about the things we would do in our new place. Having a dog topped big on the list. 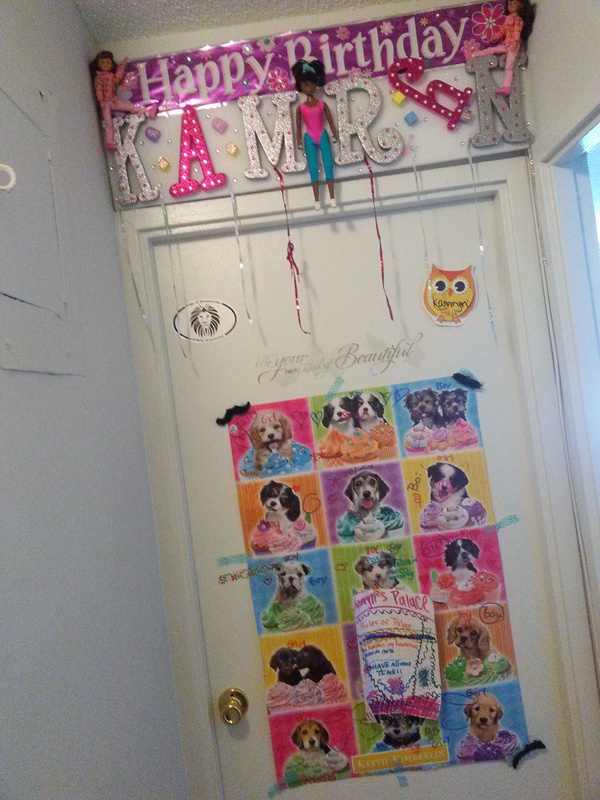 Kam’s room door, full of her puppy love. Whenever she would go visit her dad’s side of the family, she was surrounded by dogs. There was Mia, who had an array of pastel-colored hair bows she was never seen without, and Tigger who would topple her with licks as soon as she came through the door. She must have felt like the odd gal out. There was no Fido waiting for her at her front door when she got home and she desperately wanted to change that. She wanted entrance into the club. Eh em, contrary to what some think they know, I am not one to easily bend to Kamryn’s every desires. I can be firm and tell her no. However, I felt partially responsible for this need of hers and was thinking of at least entertaining her idea. After all, she is the only child, and regardless of the play dates I arrange, how many times we play Barbies and hide-and-go seek, or the proximity of her cousins who literally live around the corner, there is nothing like having your own…24/7 companionship. I grew up with two siblings, so I know firsthand. So, armed with guilt and my-not-gonna-cave-no-way-no-how demeanor, on one crisp Saturday afternoon in March, we took a trip to Animal Care and Control of NYC. 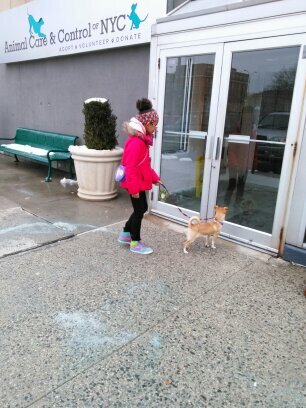 The plan was to just look at the selection of dogs, not to actually take one home with us. But things didn’t quite pan out as I had thought. I had a rational fear of dogs that prevented me from seeing why they were man’s best friend in the first place. I could only see teeth sharp enough to arrive at bone and had flashbacks of being chased by a stray hound for a block and a half when I was about ten, and the neighborhood terror Pluto, while I was on skates and stood motionless, bawling in front of the Alexis, my six-year-old nemesis at the time, who from my vantage point was taking a little too much pleasure in this. The last thing I could fathom was willingly agreeing to be in charge of a dog! But that’s just what happened. It was as if I had lost control of the situation or perhaps I never had control to begin with. The truth was, although I was against it, for various reasons, I just wanted to make Kamryn happy. How hard could it be I thought (yeah right) ? 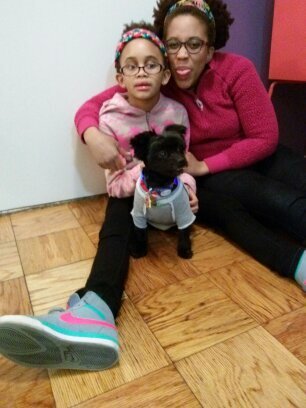 Besides, Kam had also asked for a little brother or sister. I figured I could buy some time by giving her a pooch instead. So I signed some forms, changed his name from Salute (as named by the shelter staff) to Kody (a name I had planned to name my first-born son) slide some tags on his collar, and trembled out the doors, terrified of what lay ahead. Introducing Kody!! Home, on the first night, after we had him groomed and went on a mini-shopping spree at Petco. 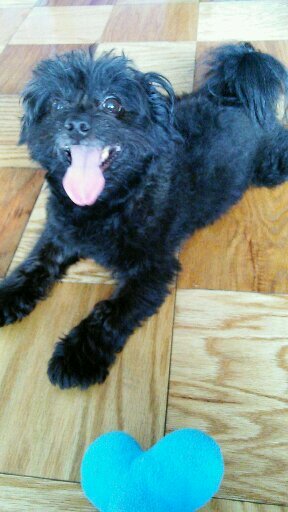 Kody was a seven and-year-old Shih Zhu mix stray found in Bushwick. He was matted and I for one could not see the beauty that lay beneath his layers of thick black hair. He was restless and peed in every aisle in Petco when we initially left the shelter to have him groomed and buy dog stuff I didn’t know I should get(a spray that made him “go” only wherever you sprayed it…which btw did not work at all). He had separation anxiety. He would bark non-stop when we left him home. No matter what I tried: leaving the TV on to The Animal Planet or giving him free reign of my apartment, he would not pipe down. If he did, it was only temporary. He would start yelping again (as I would hear firsthand after closing the door and waiting to hear just what happened when we left). He barked to the point where some wicked neighbor complained, hence the reason I had to go to court. My apartment complex does not allow dogs (although everyone and their mama has one! But that’s another story). Rather than choosing to fight a fight that for many reasons I felt I had grounds of winning, I decided to arrange for him to relocate to a different home. I was emotionally spent and just wanted things to go back to the way they were. I wanted to regain some semblance of peace once again. So I signed a piece of paper agreeing that I would not have dogs in my apartment for a year (visiting dogs included). The probation came with the terms that management could do spot-checks for an entire year, at a whim. Trying on some new threads at Petco. He was not too happy about those shoes, or hat… Lol. I am avoiding going into detail about the struggles we encountered. I don’t want this—neither is there a need for this— to be a play-by-play, day-to-day run-down of life with Kody. Maybe because it is 12:29 am and my alarm is set for 5:00 and allIwannadoisleep, or maybe, it’s because, (and I’m sure this is the more precise reason) I don’t want to relieve the pain of loving someone so much, and having to give him up. Although I thought I was about 90% healed, as I write this, it is clear that that percentage is a little too ambitious. We have come a long way since those first days when we had to find him a new home. I had to get rid of everything of his so I could stand being in my home without being blue. Kam and I have come to the point where we are able to talk about him lovingly and are able to think back to the joy he brought us, not the pain his departure from our lives left us with. We are slowly filling the void his absence caused. I honestly did not think that was possible. We can now laugh when we remember the morning after we got him and how he, unable to wait for me to walk him, released his bowels in front of my bedroom door. We reminisce about the times he would, upon realizing I discovered his pee stains on my sofa, would run and hide behind Kam or under her bed. We laugh when we think about the times the three of us would play hide-and-go-seek together and he would find us every time. On one occasion, upon discovering me in the tub, crouched down on my knees, with my face to the bottom of the tub, he actually tried to jump in! Then there was the way I would spin him around on his back, vigorously rubbing his stomach, while he squirmed and laughed, like actually laughed. Up until that point, I had never heard a dog laugh before! Although we have many laugh-out-loud moments with Kody, I have my personal two all-time most touching Kody moments. The first is that whenever I would get really excited while watching a movie and start yelling at the screen as if the characters could hear me, Kody, who would be laying on the floor, or licking his fur, would immediately stop what he was doing and run up to me. He would lick my hand or knee or whatever skin was exposed at the time. 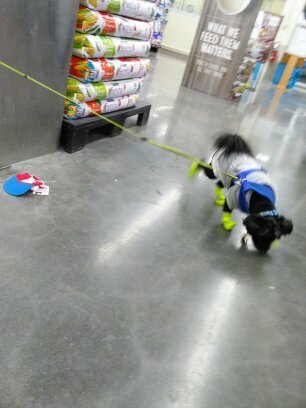 He would then hurry to locate his toy. He did not like noise and his thinking was that if I played with him, I would be forced to take my mind off what he deemed had gotten me upset! Playing with his toys helped him, I’m sure he thought, so of course it would help me as well. My other moment is the time we were coming back from an early afternoon walk and had come across the neighbor who I am convinced complained on me. This neighbor and I had a tension-filled, yet controlled conversation while I held Kody in my arms while standing in front of my front door. I was clearly not pleased with his presence. I shut the door after telling him I knew it was him who complained on me, and did not think anything of it. Kody had no reaction and I was just glad to get him out of my sight. However, that day in the hallway when we were coming back from our walk, when Kody saw him, he started growling. Like teeth together, fury in his eyes, if I had let him go, the man there would have been blood, kind of growling. Now Kody wasn’t the kind of dog to bark or growl for no apparent reason. I was confused at this outburst, and it wasn’t until I closed the door that I connected the dots. He was defending my honor! He knew I didn’t like the neighbor, and he was showing his solidarity to my cause. I realized then that it’s true what they say: they are super loyal. This post is filled with a lot of Kody’s effects on me, mainly because since he recognized me as the person who rescued him from his predicament (he would literally follow me wherever I went. If I hiccuped, he stirred, if I got up in the middle of the night, he wanted to know where I was going.) and he gravitated to me. 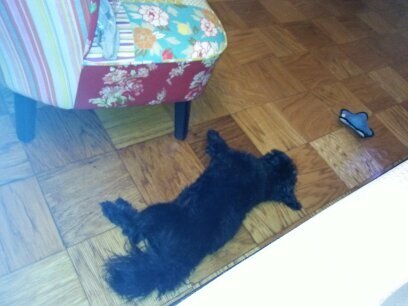 However, Kody certainly had an effect on Kamryn. The most poignant lesson I know he taught me and that I have been sure to share with Kam, is to always step outside of my comfort zone. Growth cannot happen if you are always comfortable. He also emphasized the point to help those in need. He needed a loving home and I gave it to him. However, the lesson that is attached to that I shiver at even bringing to light is that, sometimes, love is not enough. 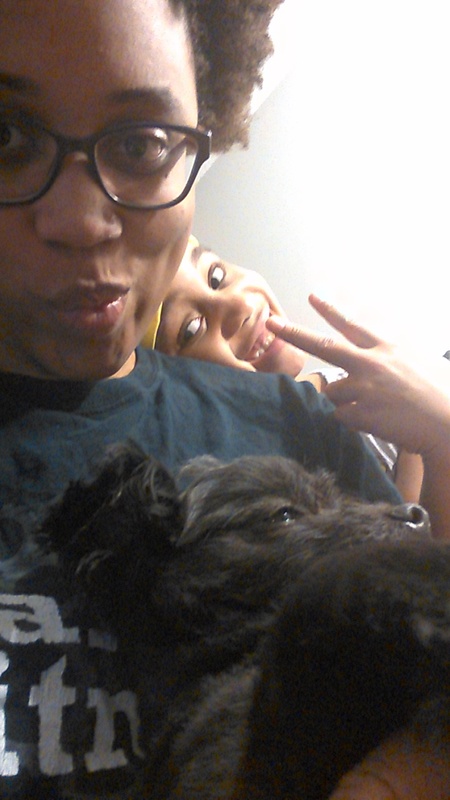 I loved that dog beyond words, we both did, but all the love in the world could not keep him with us. On the same breath, he also drove home that some people and things are for a season. You don’t know how long you may have that person or thing in your life, but the wisest thing to do would be to enjoy it while it lasts. Because who could resist a face like that?? 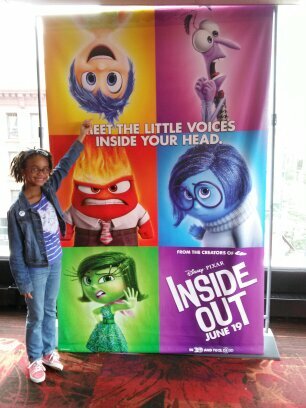 At the start of summer, I took Kamryn to see the Pixar animated comedy-drama Inside/Out. That movie was amazing on so many levels. Without giving it away, the most essential theme was that in life, although it can be a struggle, no matter what, we must always choose happiness. The movie magnified the fact that there is an everyday struggle between joy and sadness, but above all, no matter the difficulty, we must choose laughter over sadness. The best is yet to come, and if we just hold on, keep the faith, and keep smiling, it will all work out in the end, it has to! That movie also showed that once a negative image is associated with a memory, even if that memory was positive before, it now becomes negative. I am fighting to keep the memory of Kody a positive one. His season with us was brief, but he taught us more than ever anticipated. We will always love you Kody. No matter where you are, no matter where you lay your head at night, no matter who tickles your tummy or holds you in their laps, or walks you as the sun sets on another day, you will always be a Johnson. What are some extreme things you have done for your children, just to put a smile on their faces? This past Friday, Kamryn, my niece and I ventured out to a popular locale that I have only passed on the train but have never actually wandered inside of. 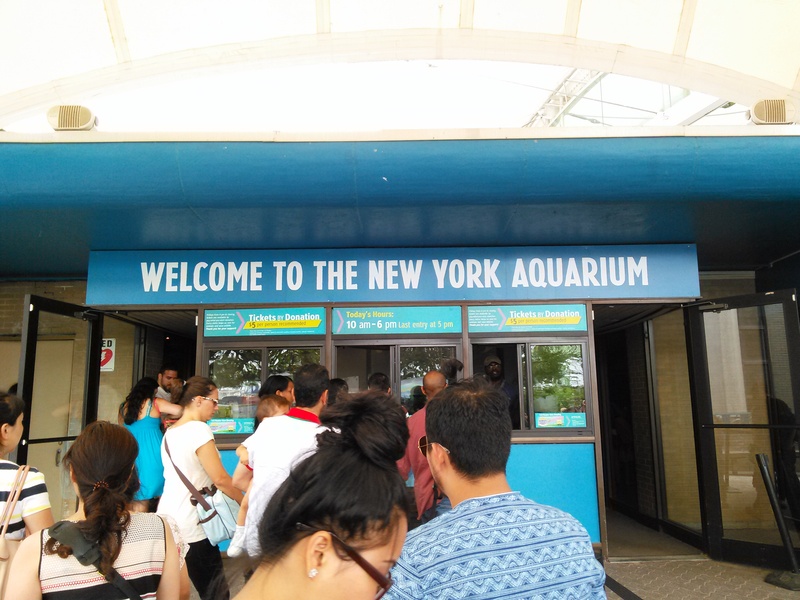 We went to the New York Aquarium, located at Surf Avenue and West 8th Street, steps away from the Coney Island boardwalk. I chose to go on Friday in particular because every Friday after 4pm is “pay-what-you-wish-donation”. The standard ticket price is $11.95, so I really wanted to take advantage of this perk. I paid a $1 for each of us. 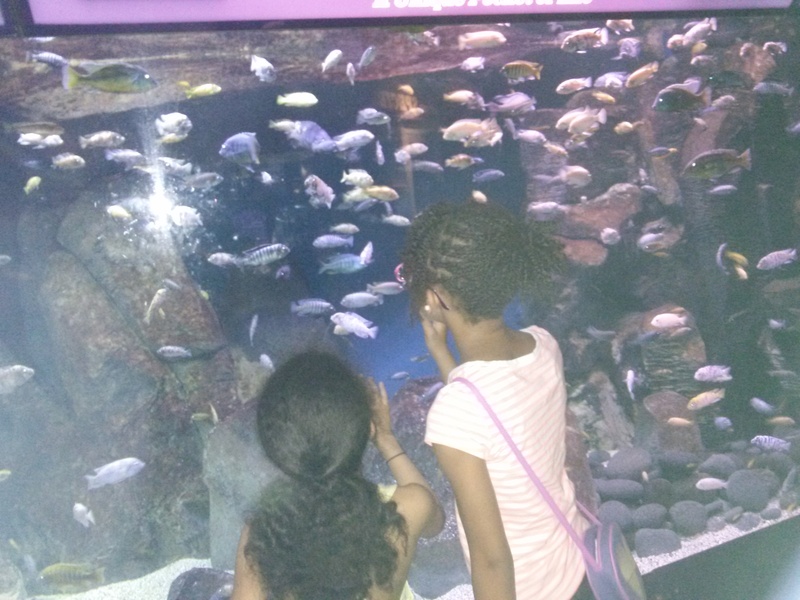 Apparently, as to be expected, a trip to the aquarium– that initially opened in Battery City in 1896, and has graced the Coney Island neighborhood since 1957 sitting on 14 acres of land–was on the agenda of many folks. As we darted off the train and down the steps and I nudged the girls ahead of me so we could try our best to secure a spot that wasn’t dead-last on the line, we saw just how far it wrapped around! The aquarium staff circled the line to alert us that due to the length of the line and time (we got on about a quarter to 5) not everyone was guaranteed entrance. The cut-off time for letting visitors in is 5, an hour before closing. In spite of the current renovation (that should be completed some time next year) that has caused some parts of the aquarium to be off-limits, we had a pretty swell time. We were able to take in the exquisite coral reefs. We stared in wonder at the assortment of fish swimming around in a frenzy who paid us absolutely no mind. They were used to being on display and were therefore unfazed by the bugling eyes, opened mouths, and flashing cameras tracking their every move. There were various stations that displayed fish from around the globe. It was clear that the fish was the girl’s favorite part. They were reluctant to leave when I attempted to usher them elsewhere so we could take in all we could in less than an hour and so that I could get the most out of my $3. 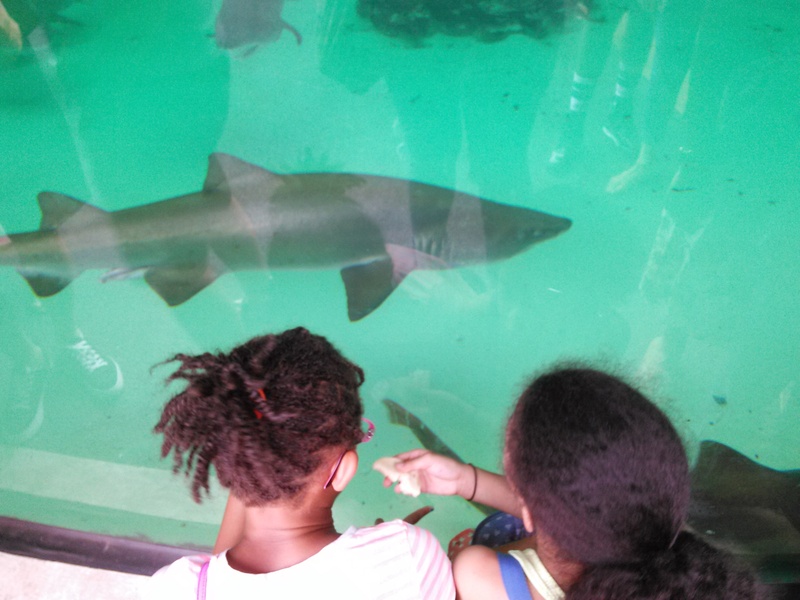 There were still sharks (which was my personal fave) and penguins to see. 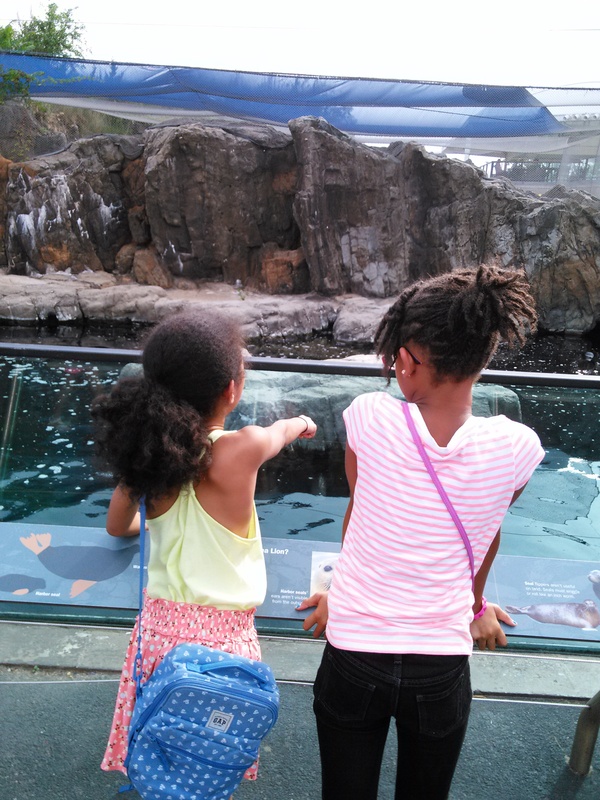 There would be no sea lion show for us. By the time we got there, all the seats had already been filled. 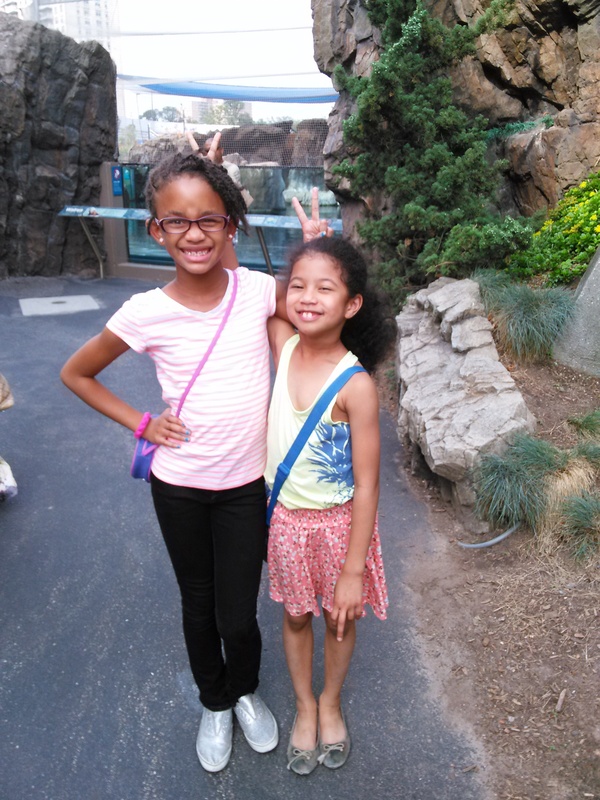 After leaving the aquarium, we sauntered over to the amusement park (how could we resist the temptation?) 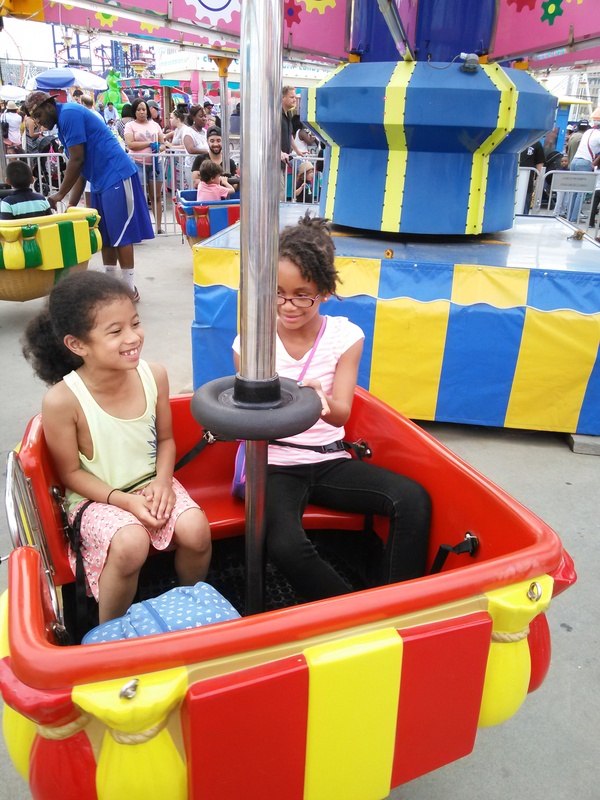 and the girls went on a few rides in Deno’s Park (though upon leaving we saw that Luna Park had much cooler rides: a must-go for next time). We ate, they played in the sand, and we boogied to the brave souls singing karaoke at the DJs headquarters. 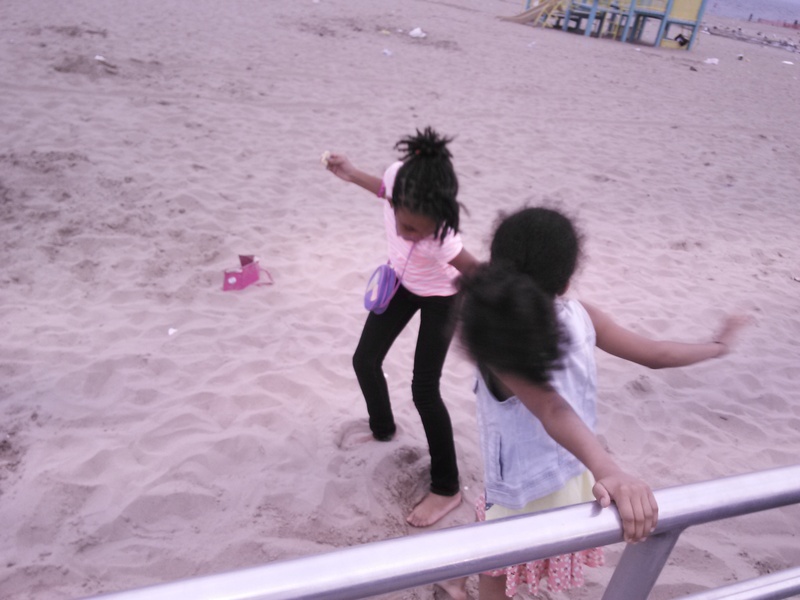 Where are some places you enjoy going with your kids that are inexpensive or free?